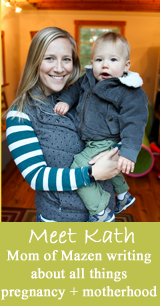 Nursery updates are my favorite BERF posts to write : ) Those and bumps, of course! The closet before was beige and dingy and scuffed up. 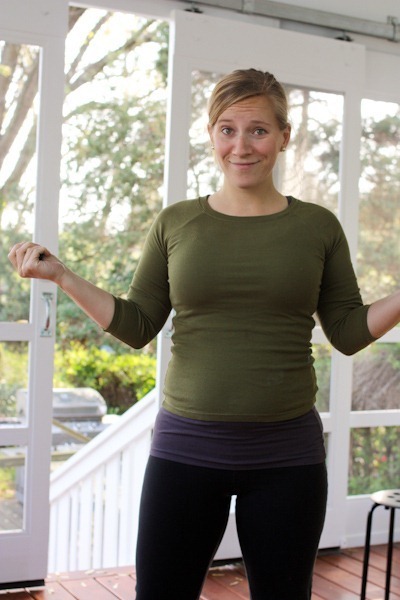 I love being able to close doors, but you guys were smart to recognize that with a baby in my arms, pushing a curtain aside – or just leaving it open – is more practical. 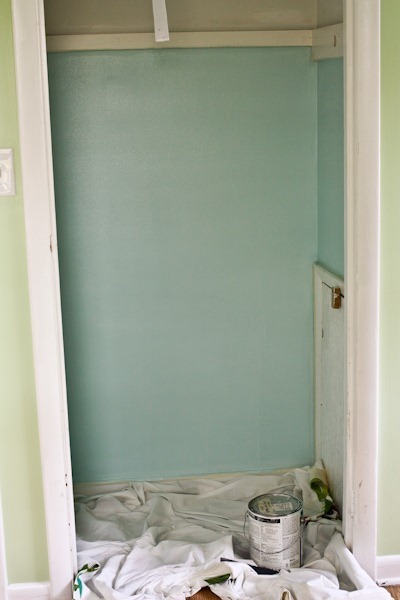 Luckily we have a few half gallons of paint left from our house re-paint when we moved in, so I used some of the living room paint to coat the walls a seafoam blue. Luckily this project was in a closet, so I could make mistakes. I am not a great painter at all! I’m way too hasty to stay between the lines. I had no painter’s tape, so I just used masking tape. 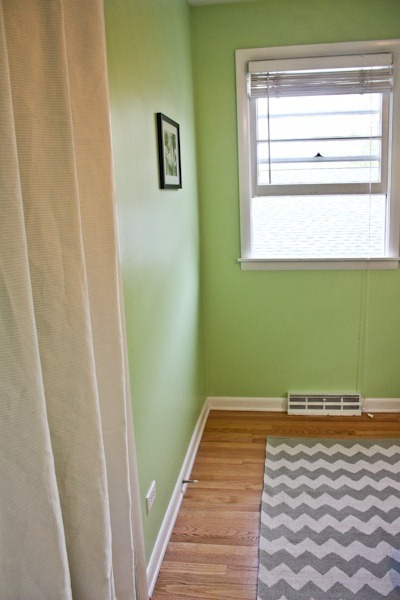 And an old curtain for a drop cloth. And a skewer to mix the old paint. Crafty! Also check out my painter’s outfit made up of clothing I never wear. When did this shirt ever fit!?!? You can still see the lines where I cut in with the brush where the roller wouldn’t quite fit, and there are a few corners with issues, but who is going to see them!? I hung those wooden hooks too – no idea if they’ll get used, but it seemed like a good spot for them all tucked away. We have plans to put either shelves or a tall dresser inside. 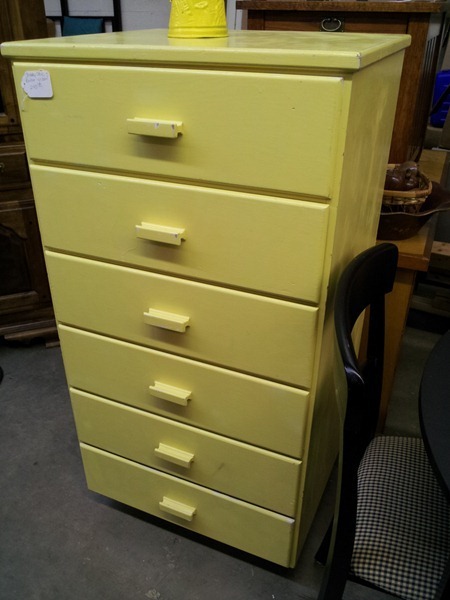 I popped into Possessions Recycled this week and found this perfect yellow match. It’s smaller and more square than it appears in the photo, and it would fit in there well, I think. The problem is they’re asking $250, but we’re hoping to haggle down. It sure would brighten up the space! Another surprise – with the blue and white, I now love the green walls. I’m going to tone down the yellow and gray theme a little bit (it was never going to be 100% anyways) and just keep the colors calm and fresh. For the curtain, Matt picked up a tension rod at Lowes and we hung a curtain we had in our old master bedroom [= recycling!] I love white flowing curtains. 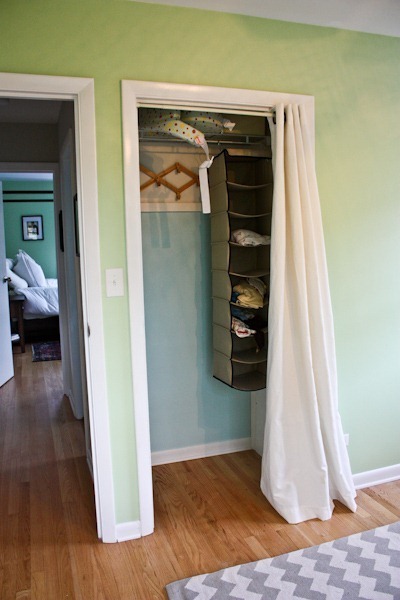 [And also sort of prefer the closet open instead of closed now!] Cost of the closet project: about $10 for the curtain rod and a roller brush. 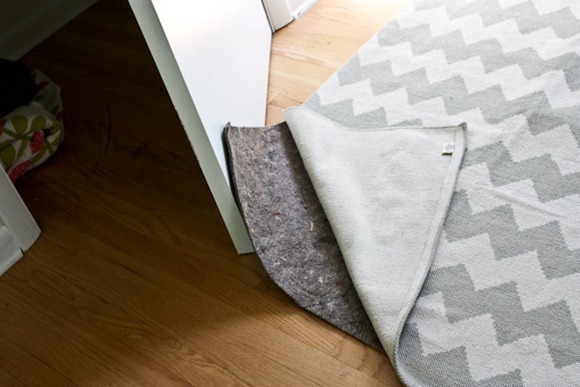 Sure works great with the rug – and the room feels bigger too! 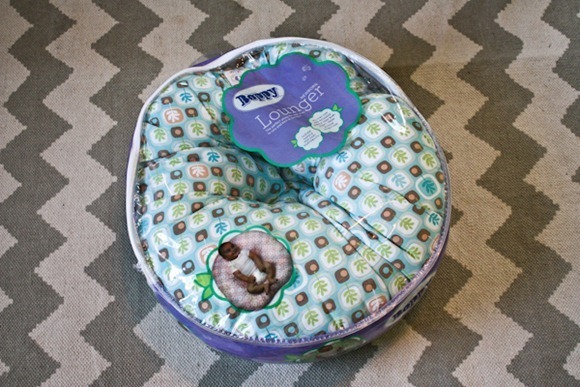 Now we just need a crib….and it’s ON THE WAY! Remember the Baby Mod crib I tried to buy 3 times with failure? I just happened to check again and it was in stock…purchased….and I got an email that it has shipped. Crossing my fingers! I also found this dresser while browsing used furniture and quite like it. But I’m afraid it’s too short to be a changing table. I believe my current plan – IKEA Hemnes – is much taller. This would save a hundred though! And funky modern is always more fun. Ahh, yay, crossing my fingers that the crib works this time! It’s so pretty. 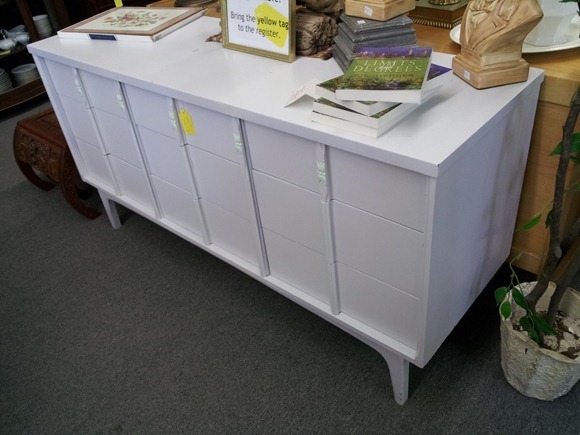 I do really like that long white dresser – the mod style is very fun. That’s awesome that the closet project was so affordable. Nice job! I bought the IKEA Hemnes for my nursery this weekend. It is the PERFECT height to use as a changing table. I do enjoy a nursing update myself, too! Ugh I LOVE the colors! 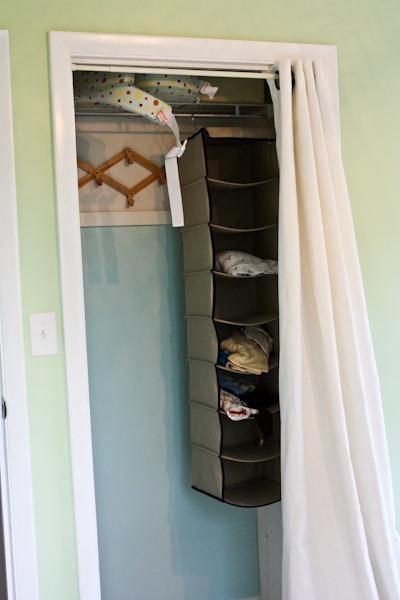 I need to do something with the ‘closet’ in my nursery/toddler room. It’s more of a dent in the wall but I never thought to put curtain across it (it’s wide but not deep) and now I want to do both. Love the seafoam blue paint! 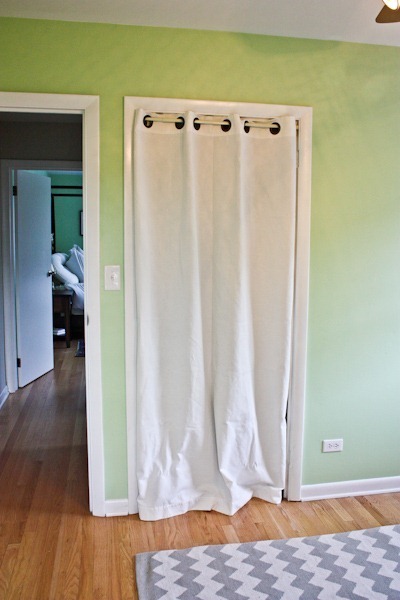 The idea of a curtain instead of a door was great!!! I never thought of that. The room is coming together nicely! I have the IKEA Hemnes in my son’s room. We actually had it leftover from our master in our old condo. Then we used in the guest room. Now we use in his room. Its still in great shape after 6? years! Ahhh!!! You are so ahead of the game! We are moving in about a month or so and in order to contain the chaos I am trying to hold off on ordering anything until we do. But it will be exciting to start getting a few bits and pieces. Let the list making commence. I think shorter is probably better for a changing table. I never ended up using mine because a) it was to high and I was constantly worried my daughter would fall off and b) it was awkward changing her from one side (I don’t know why they are all built like that….). I ended up buying one of those big absorbent cloth changing pads (they’re washable) and changed her on the bed all the time. that way if I had to run and grab something (it happens! ), I could leave her there, or if it was a real mess I could do it in the bathroom, etc. It provided a lot of flexibility for changing time. Being near a water source and a tub seemed to me far smarter as far as changing was concerned. We never bothered with any kind of changing table set-up, we mostly do changes on the floor. You can go to a fabric store and get a remnant of thick vinyl (like you might use of a plastic-coated table cloth or something) for a few dollars and cut it to the size you need. We placed that on top of an extra yoga mat on the floor for our changing space. It can just be rolled/folded up and tucked away when not in use. The vinyl makes for super easy clean-up — just might with a damp cloth and perhaps a spray of dilute, baby-safe cleaner. You’re doing such a great job! YES for your nursery starting to come together! 🙂 I can’t wait to see it with a crib in it! …..I think I’ll have a heart attack when my baby’s room no longer has an elliptical in it and will have crib! That will be one crazy moment! 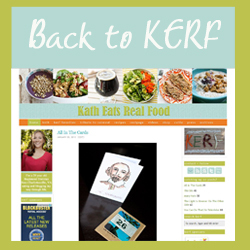 Wow, we are moving right along, Kath! 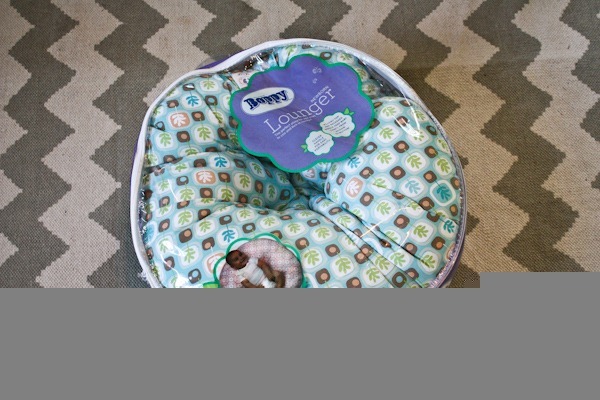 Boppy Lounger is a savior in the first 8 weeks! Good gift choice! My advice? Wait on the dresser until you have the crib and have I put together in the room, or do some careful measuring so you can see just how much space the crib takes up. We have the three Drawer hemnes and I went back and forth between the three and is drawer. 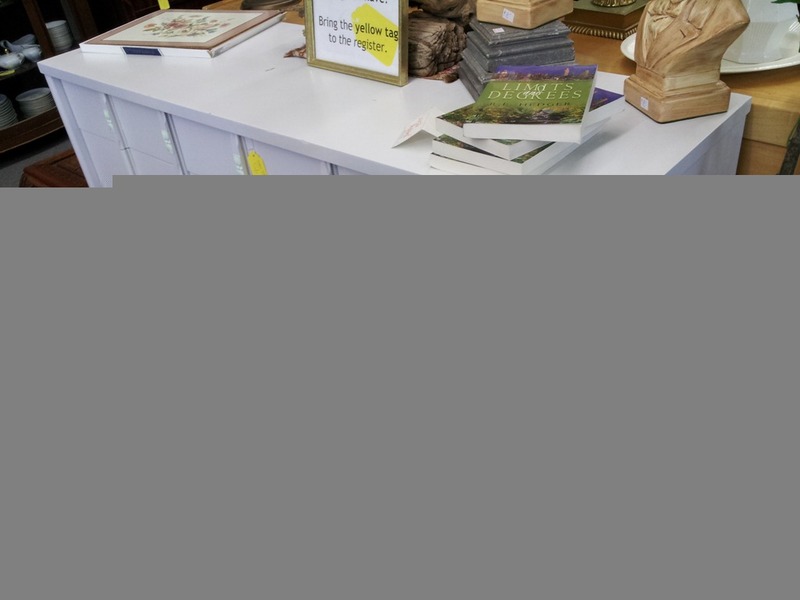 While the six drawer would fit…..the room would have felt over powered by large furniture. I did not do a good job of visualizing how much space the crib would actually take up. Love the blue and green combo! We did our daughter’s room for her “big girl” room with Ikea…and I’m pretty sure we bought pieces from the Hemmes collection. It’s white and has been super functional and durable the past 2 years for us. 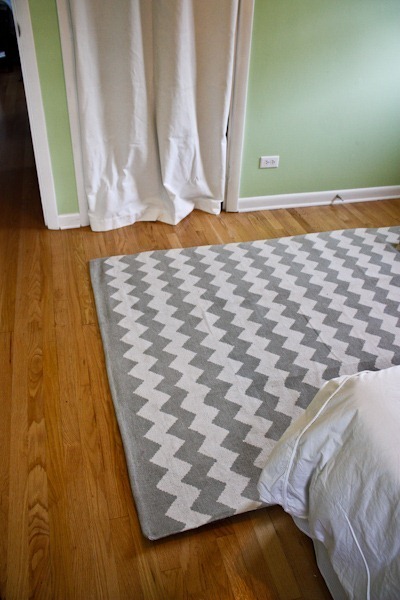 I am still in love with that Urban Outfitters score$ of a rug you got! Good morning Kath! The nursery looks great! I just got home from my first trimester screening which involved a sonogram and the nice tech said she would guess BOY! Obviously it’s still early as I am 13 weeks along, but it’s still fun and exciting! I am lucky enough to have one healthy child (a girl) so we are only reallly concerned with having another healthy child, but my husband is having fun day dreaming all the toys and movies he would like to share with a son! My due date is Oct 9 and I’m really enjoying your BERF blog as you are a little bit ahead of me! We made a shallow box for on top of an old dresser. Put felt on the bottom so it wouldn’t scratch. Covered a piece of foam for the little mattress. Made the box longer than the mattresses so we could store wipes and other necessities. Put a hanging light over for light. It was like a big tray. That was 25 years ago. Now the dresser is in our foyer, not a scratch on it! I vote for the white dresser you found and let your Matt come up with a “tray” for the top! DO NOT PUT THE CRIB UNDER THE WINDOW! It is a hazard because whenthe baby can stand they will grab the cord for the blinds and they can choke themselves!! On a happy note, the room looks great! It’s not going under the window – but on the wall beside it. We also took the blinds down. I agree with the comment about it being awkward to change from one side. I have three girls and tried a changing table with the first one and found I never used it. I either changed them in the crib or if we were in other parts of the house just changed them there. I could see one being more usable if you could get vertical with the baby. Btw, you are “glowing”!!! Are you going to hem the curtains? No, not the closet one. I let the hem OUT on the window ones – to come! Aren’t you worried the part dragging on the ground will get dirty? I don’t know though b/c my kids would try to swing from curtains or chew on them. Hindsight…and this may not matter to you, but thought I would share. The tall dresser is a good idea. Why? 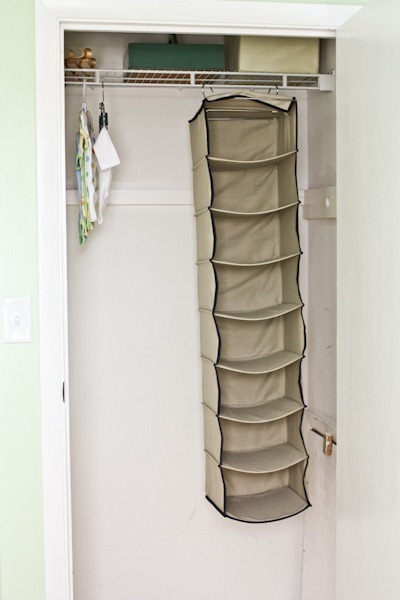 Because it DOES fit in the closet if you EVER find yourself having to toddler proof the entire bedroom. We own a long dresser/changing table. When Levi started climbing out of his crib, I wanted to put him in a toddler bed/mattress on the floor. I wish I had purchased a tall dresser that could fit into the closet to keep Levi from climbing the drawers, but I did not. Just a thought. Hmmm. Good insight, but we took the door off so I think the baby will still be able to get to it! That tall dress is way over priced, even with haggling. Keep looking, you’ll find what you really want at a better price. I’m sure you can find one on Craig’s List. 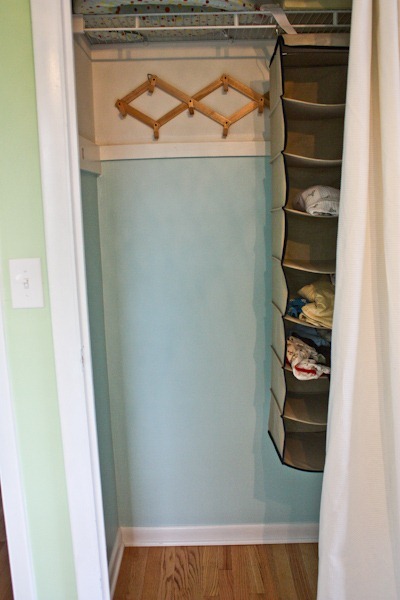 I love the blue in the closet! 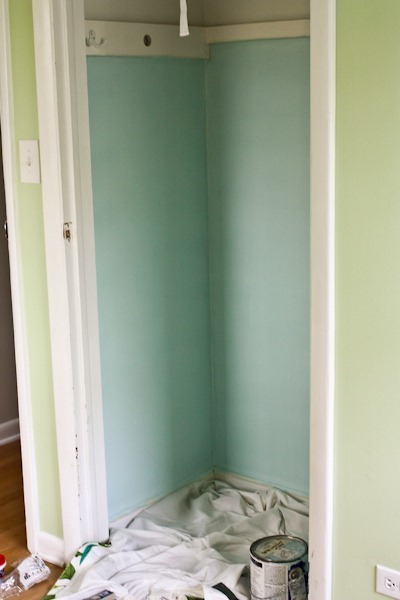 It is close to the color I want to paint our nursery, maybe I’ll take off my tiny closet door and paint the inside too. Previous post: 18 Weeks: I Got Kicked!